PrepLadder brings forth this blog with a view to familiarize aspirants about the suitable strategy one should adopt to avoid losing marks to negative marking. First and foremost, all the students who fear negative marking, there is no need to panic and feel worried about. Nothing new is going to be asked in the examination, everything will come from the syllabus you have been preparing for so long. Just have a good command on your subjects and syllabus of the exam. According to a research regarding what candidates should do when there is negative marking in the exam, 64% candidates admitted leaving the unknown questions, 26% said they will decide after having a glance at the questions and rest 5% admitted attempting all the questions. Candidates who are planning to skip all the unknown questions may make a mistake as they may miss a chance to augment their score. In an exam with 25% negative marking, you can theoretically be positive even if you guess all the answers. For example, you guess 4 answers and by a 25% chance, you get 1 correct and 3 incorrect. In this case, you earn 1 mark (+4-3). But this does not mean you can go about guessing every answer. 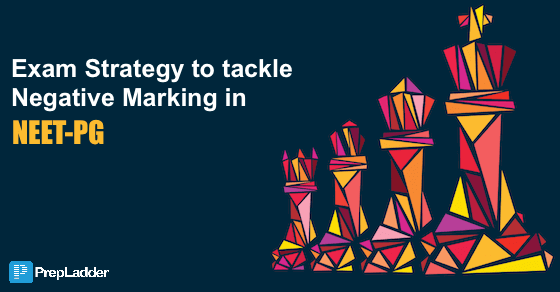 Losing marks to excessive negative marking can be catastrophic to your attempt. To get a decent rank you must attempt 270-280 questions in NEET PG. Confused!! what rank and how many marks are required for a particular branch?? If your preparation is on point, you will know around 190-200 questions. In this case, you will have to make an intelligent guess in about 80 questions and leave 20-30 questions that are completely alien to you un-attempted. Can you eliminate an option? In an exam with 25% negative marking, it's advisable to go ahead and guess even if you can eliminate one option. This would give you a higher probability of being positive on all your guesses combined. This is certainly the most important success key. Read the question and all the options carefully. No matter who is conducting the exam, the options in NEET PG will be confusing. You might think that you know the answer after reading just first 2 options. But before you answer any question, do read all the options properly. Also, do not jump to conclusions. Look out for negative words like "except" "but" "not" in the question. Because these might change the answer. If you get stuck at difficult questions first you might waste a lot of time and miss out on the easy once. So do not try to attempt the questions in order. Treat this online exam as you will treat a pen and paper based exam where you can see all the questions together. Keep your ego out of the examination hall- Do not spend a lot of time fiddling with a difficult question. If you feel that a question has taken about 1 minute, skip it and move ahead. The official TCS software to be used in NEET gives you an option to “Mark” a question. If you don’t know the answer at all leave the question un-attempted. If you can eliminate one or two options take a guess and “Mark” the question. If you are sure about the answer, attempt the question but do not mark it. Conventionally, we are taught to believe that the first option chosen was most likely to be right and it’s better to refrain from changing. But research shows otherwise. Most of the times we change from wrong to right. But we remember those few instances where the right option was changed to wrong. This act of selectively remembering unfavorable/usual events is Von Restorff effect. The percentage of “right to wrong” changes is 20.2%, whereas the percentage of “wrong to right” changes is 57.8%, nearly triple. So do not refrain from changing an answer if you feel like. Which option should you mark after you have eliminated 2 options? Many examiners subconsciously feel that the correct answer is “hidden” better if it is surrounded by distractions. So option (b) and (c) are correct in an uneven percentage of questions. Use this trick only if you’ve eliminated 2 options and cannot guess between the other 2 at all. Go through the whole test in the first 150 minutes. Attempt questions that are easy for you. Take a guess and Mark the once if you can eliminate one or more options. If the question is absolutely alien for you, leave it un-attempted. Remember you have 30 seconds for each question at this stage, so never get stuck on a question. Let’s say you confidently answered 190 questions, Answered and Marked 80 questions and left 30 un-attempted. Review your exam and go to the “marked and attempted questions”. Remember these are the questions you were confused about. If you feel that you need to change the answer to a certain question, do not hesitate to change it because the chances of “right to wrong” changes are 20.2%, whereas the chances of “wrong to right” changes are 57.8%, almost three times. You have more than 30 seconds per question at this stage. Use your time wisely. Scroll through the complete exam once. Be fast, look for mistakes that you might’ve made. And confidently submit the exam 10 seconds before the countdown ends. Make a habit of giving mock tests which will surely minimize your chances of getting negative marking. Practice as much as you can because then you won’t be prone to frequent mistakes. Moreover, practicing will give you an idea where you make mistakes thus you can keep in mind not to repeat these mistakes while taking the exam. Practice will also augment your speed for completing the exam and hence you can go through all the questions you have attempted in the remaining time so that you can check if you have clicked any incorrect answer by mistake and hence you will decrease your chance of negative marking. Hope this blog will help you in strategizing for NEET PG 2019. Follow these strategies with a strong willpower and faith in your abilities. Just be calm and optimist. You will surely make it!! Prepare well with a positive mind. Give your best and you will surely succeed….